Published Nov 24, 2014 by Peachpit Press. Part of the Learn by Video series. Robin Williams, author of The Non-Designer’s Design Book, is beloved and respected worldwide for her frank, funny, down-to-earth method for teaching design fundamentals. 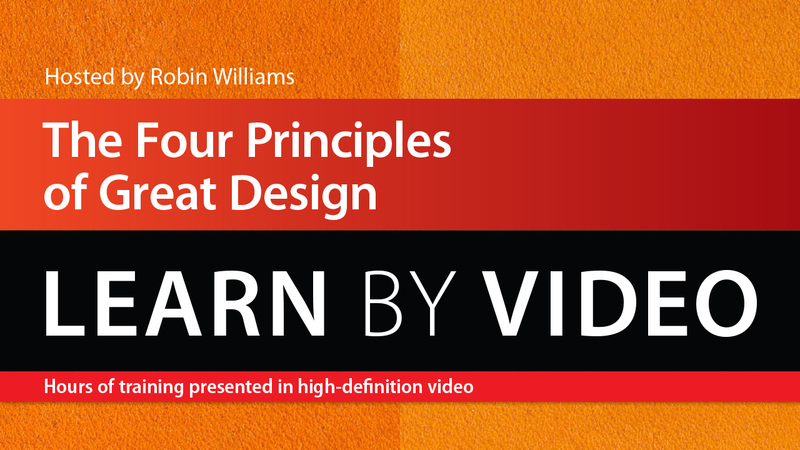 In The Four Principles of Great Design Learn by Video, Robin brings those teachings to video for the first time. In this three-hour course, you’ll learn how to effectively use contrast, repetition, alignment, and proximity (C.R.A.P.) to create professional-looking brochures, ads, business cards, and more. Robin explains these core design concepts in the context of real-world design projects that anyone from non-designers to budding professionals can use to gain a solid understanding of what makes great graphic design. The video is wrapped in a unique interface that allows you to jump to any topic and also bookmark individual sections for later review. The unique “Watch and Work” mode shrinks the video into a small window to allow you to work alongside Robin as you view the video. Project files used in the lessons are included on the disc so you can practice what you’ve learned and at the end of every lesson, you can test your knowledge by taking interactive quizzes.